Higher than average probability of developing health issues during its lifetime, hence the cost to insure is above average. The American Bulldog is a large, stocky and powerful working dog breed from the Mastiff family. They have distinctive half-erect pendant-shaped ears and a strong jaw. American Bulldogs can trace their lineage from the American Johnson Bulldog and the Scott Bulldog. American Bulldogs are bigger, faster and more agile than their English counterparts. Their strong legs mean they are able to jump very high, in some cases up to 6 feet. 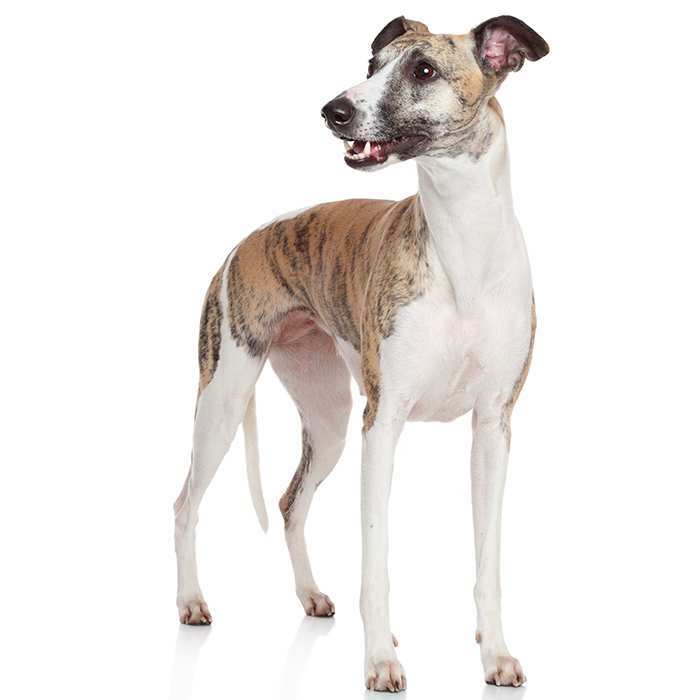 They have short, coarse fur which usually comes in white and brindle, though there are many different colours available. 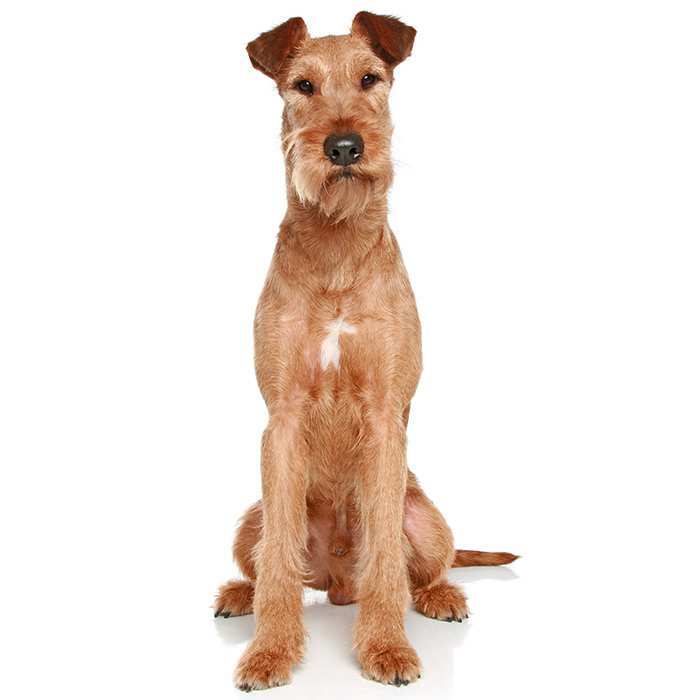 They are light to moderate shedders, but do not shed as much as other dogs because they do not have a thick undercoat. A healthy male American Bulldog should weigh between 30 and 59 kilos while a female should weigh between 27 and 41 kg. Males usually stand at about 50 – 71 cm tall and females are usually 50 – 61 cm tall. Their lifespan is between 8 and 15 years. American Bulldog breeders have bred them as working dogs and so the breed requires a decent amount of exercise. A long walk each day along with sufficient play time should be enough to tire it out. 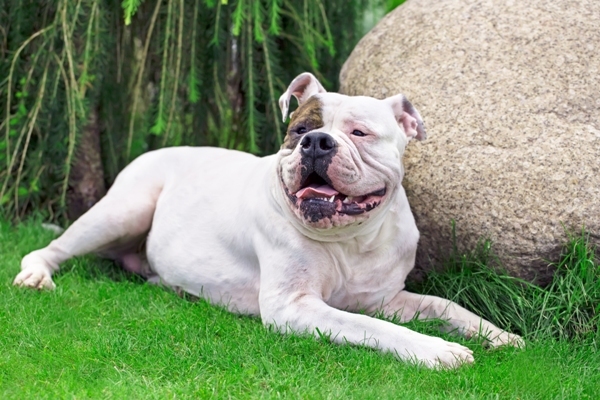 The American Bulldog is a loving, affectionate and fiercely loyal companion. 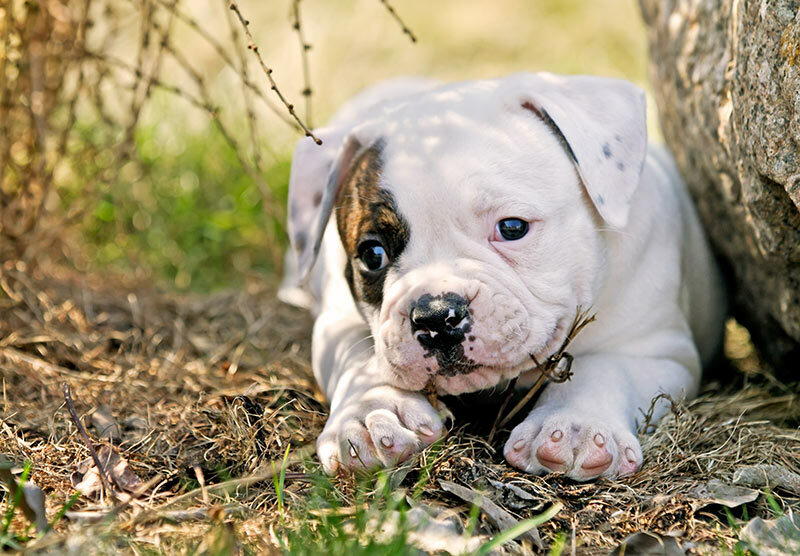 As long as the American Bulldog puppy is socialised and trained from a young age, it is great with children and other pets and has been known to perform heroic acts in order to protect its loved ones. They are not hostile dogs, and despite their tough looks, they’re in fact dogs with very sweet temperaments. They are extremely energetic dogs and even though they are relatively inactive and mellow indoors, they’ll jump at the chance to play fetch, go for a walk or run, swim, or jog alongside their owners on bikes or skateboards. If the American Bulldog does not receive enough exercise each day it may become anxious and highly strung. They are easy to care for and look after; they only need a bath when necessary and can be brushed easily with a firm bristle brush. Be warned, however – American Bulldogs do tend to drool.  Hip dysplasia is a common condition among larger dog breeds where the thigh bone does not fit properly together with the hip joint, causing pain, lameness, and arthritis later in life. X-rays may be performed to confirm if the dog is affected, but dogs with hip dysplasia should not be bred. Elbow dysplasia refers to the abnormal development of the elbow joint early in the dog’s life, and is commonly found among larger dog breeds. It can lead to pain, joint laxity and lameness. Medication may be required to control pain, and in some cases surgery may be needed. Eye Problems. American Bulldogs may be prone to “cherry eye” (a non-painful condition which causes prolapse of the third eyelid), entropion (which causes the eye to roll inwardly, irritating the eyeball and leading to more serious issues), and retinal dysplasia (which causes retinal detachment and folding of the retinal tissue). Demodectic Mange. Demodex mites are passed down from mother to pup but are not transferrable to other dogs or humans.  These mites are normal and present in every dog, and typically do not cause any issues. 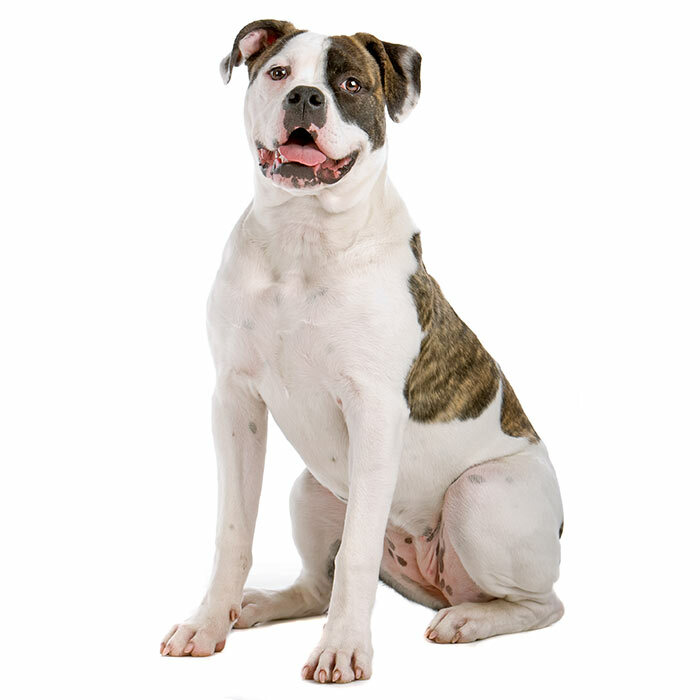 However, an American Bulldog with a weak immune system could develop demodectic mange. Characterised by red, scaly skin and hair loss, the disease often goes away on its own, but should still be discussed with a vet. Neural Ceroid Lipofuscinosis is a rare disease which can affect American Bulldogs. It causes severe neurological impairment and affected dogs often struggle to live past the age of 2. There is no treatment or cure, but a DNA test is available to detect carriers and infected dogs. Ichthyosis is an inherited skin disease causing thickened skin and painful, swollen food pads. It is a painful, itchy and uncomfortable condition for which there is no cure. Treatment often includes frequent medicated baths and ointment. Other Issues. American Bulldogs may also be prone to allergies, patent ductus arteriosis (a congenital blood disorder), Tetralogy of Fallot (a congenital heart defect), hypothyroidism and epilepsy. American Bulldogs are descended from ancient Mastiffs, which originated in Asia and came to Europe with traders and nomads. The ancient Mastiffs were incredibly courageous fighters who could bring down large and dangerous prey such as wild boar, big cats and bears. They were first brought to England around 800 BC by Phoenician traders, and the English Mastiff and Bullmastiff are some of the closest ancestors to the original Mastiffs. About 1,200 years later, another tougher strain of Mastiff came to England and was called the Alaunt. In England, farmers and butchers used the Alaunt to breed the very first Bulldogs. 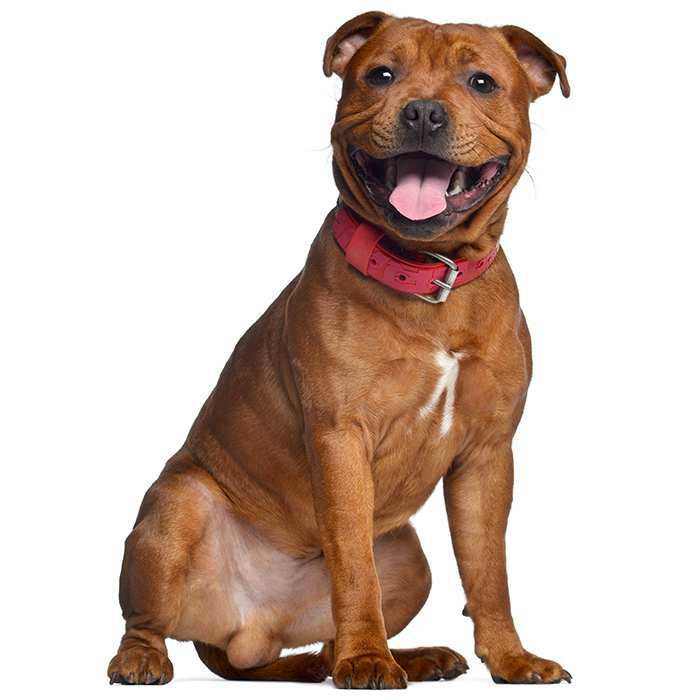 In the 19th century, coal miners from Staffordshire crossed English Bulldogs with terriers, leading to the American Pit Bull, Staffordshire Bull and Bull terriers. 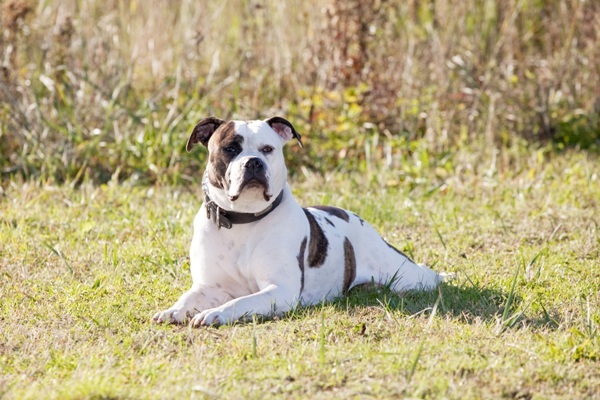 The original American Bulldog was used for bull baiting and as farmhands. John D. Johnson, after returning from WWII, found that the numbers of American Bulldogs was dwindling to near extinction. He gathered the best examples of the breed he could find and began a breeding program which led to the Classic American Bulldogs we see today. Alan Scott, joined John D. Johnson’s efforts in reviving the breed and began breeding the Johnson Bulldog breed with other non-Johnson Bulldogs to develop the Scott Bulldog, now know as the Standard American Bulldog. Because it is considered a manufactured breed, it is not recognised by the AKC. The American Bulldog was originally known as the “American Pit Bulldog”. However, its name was changed to avoid confusion with the American Pit Bull Terrier. The dog “Mel” in the movie Return to Me was played by an American Bulldog named Peetey. One of the main characters in the movie Homeward Bound: The Incredible Journey was played by an American Bulldog named Rattler, and was voiced by Michael J. Fox. In 2011 a video featuring an American Bulldog named “Bizzle” appeared in a video on YouTube in which his owner sits behind him making him appear to have human arms. The video went viral and as of 2014 had over 5 million views.  Despite not being recognised by the AKC, the American Bulldog is recognised by the United Kennel Club and the American Canine Registry. There are two types of American Bulldogs: bully and standard. Bully-type American bulldogs are stockier, heavier and more muscular.